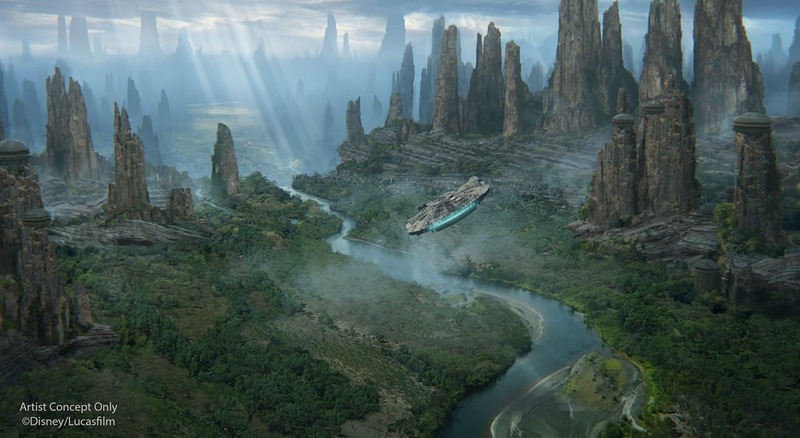 Coming soon on in between Disneyland Resort in the summer 2019, also Walt Disney World Fall 2019, is the new awaited Star Wars theme park in which is coming soon is the Galaxy Edge.. in which there’s various storylines in which you also tell, live your story in the in a Galaxy far away in where the battle in between the rebellion-resistance, the Imperial- first order..
Star Wars- Disney Parks featuring the Black Spire outpost on the Planet Batuu.. in which your adventure starts.. In which still under construction, in which you place your story in a Planet Batuu… in which you story play fly on the Iconic MillenniumFalcon- the iconic ever so constant YT1300 Corellian Freighter avoiding the imperial forces in which you explore on trading port, among rouge traders, as exploring other outpost there’s the Black Spire on the planet Batuu on the Other Rim… with shopping, cafés, restaurants within the Black Spire outpost.. The Millennium Falcon introduction gives your story adventuring on a mission as you pilot with group of your friends adventuring in piloting fighting the first order..
← #AlreadyTomorrowInHongKong #DiscoverHongKong #香港 | #MidAutumnFestival #2018- The fiery Timelapse Tai Hang #FireDragonDance – featuring Alex Rodriquez ….